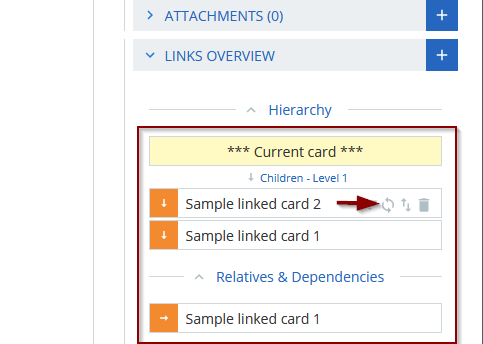 The daily work with linked cards often requires synchronizing some properties between the linked cards. 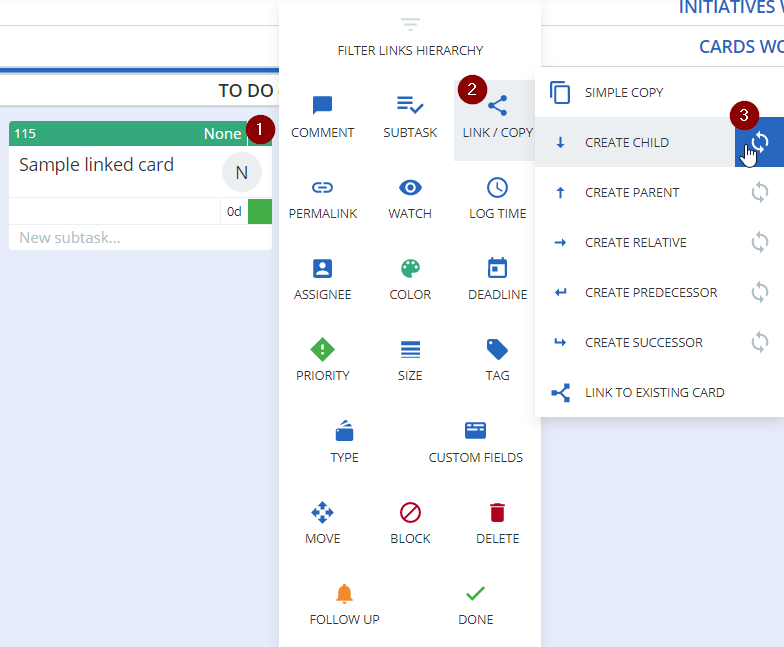 For example, keeping a parent card and all its children having the same color, deadline, custom fields, etc. Kanbanize makes this possible using the Copy and Sync Card Properties functionality. It is available upon creating new linked cards and linking existing cards. 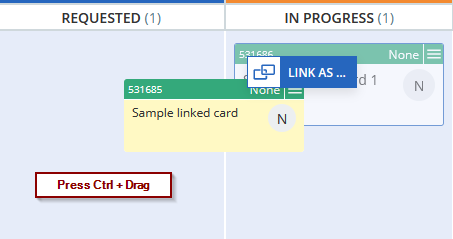 There are multiple ways to create new linked cards in the system. Let's focus on three of the most popular approaches. 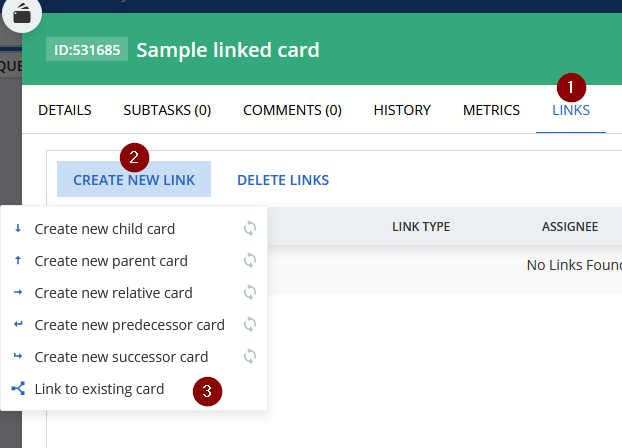 There are multiple ways to create new linked cards in the system. Let's focus on three of the most popular approaches. 1. 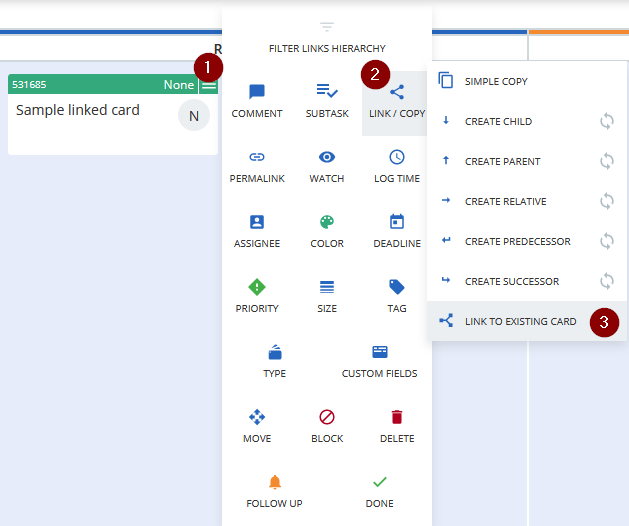 Creating a linked card via the card Context menu. 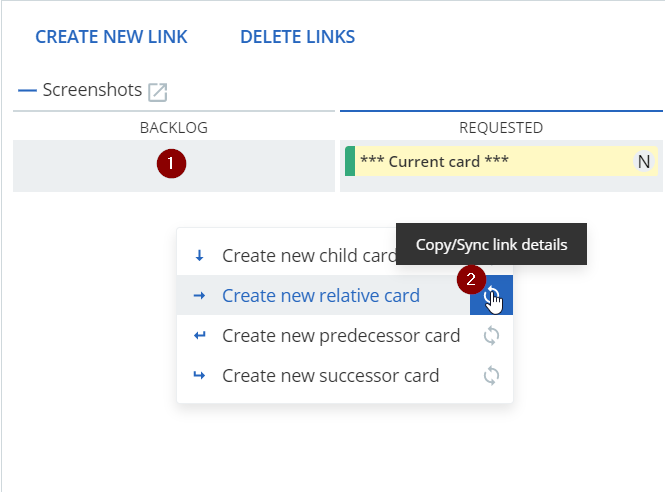 This way you can create a linked card without inheriting and sync any properties. If you click on the Sync icon (3) a panel of option appears, where you can select which properties from the original card to copy/sync. 2. Creating a linked card via the Links tab in the card details. 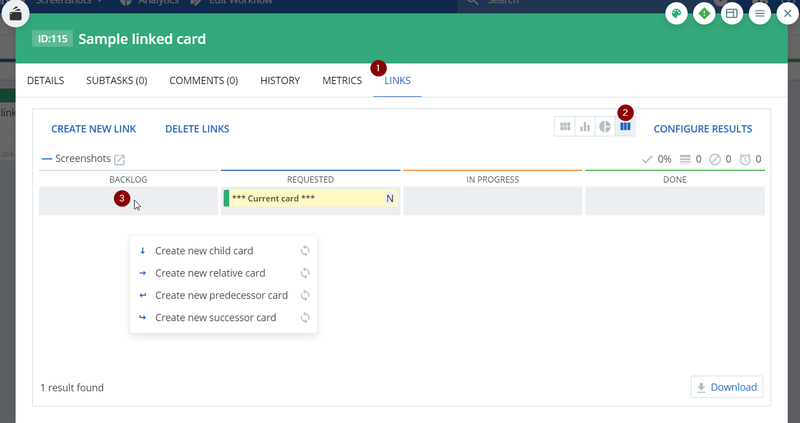 Click on the card Links tab (1) and select the Kanban preview option (2). It displays the original card in a Kanban board view. Drag and drop the card to another place on the board and release the mouse button. If you click on the Sync icon a panel of option appears, where you can select which properties from the original card to copy/sync. If you don't click on the sync icon a card will be created without additional copy/sync configurations. After you drop the card, the link menu appears. If you click on the Sync icon a panel of option appears, where you can select which properties from the original card to copy/sync. 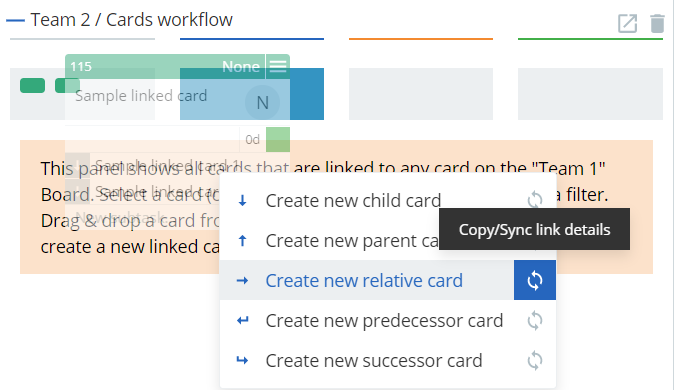 When creating new linked cards -> clicking on the sync icon triggers different behavior than clicking on the menu item. All the card properties are listed on the left side of the panel. 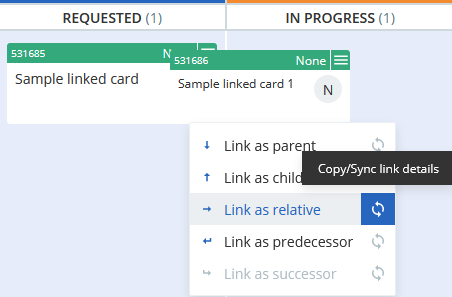 In the "Copy" column, select all the properties you want to copy from the existing card into the newly created linked card. This only happens once. 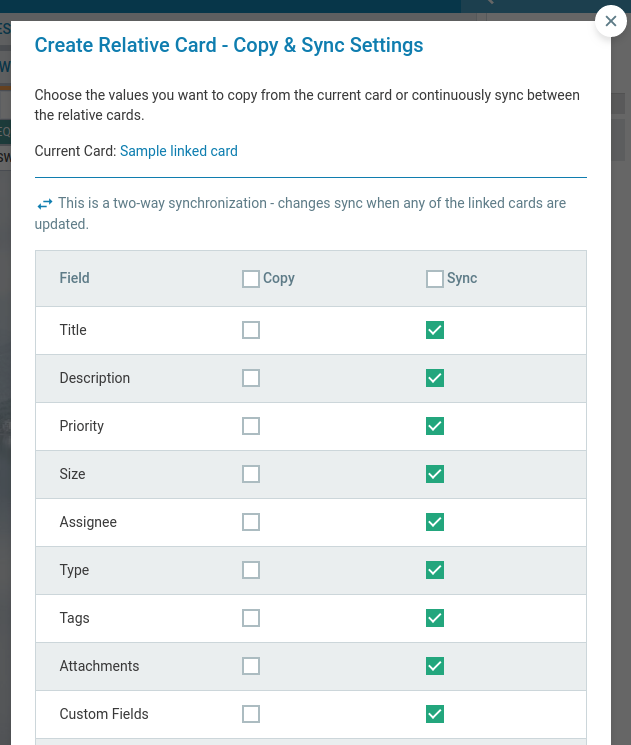 In the "Sync" column, select the properties you want to keep synchronized between the linked cards. In all cases except the Parent or Child link, the synchronization will be bidirectional. For Parent / Child linking, the synchronization is only available from the Parent to the Child. Users are also able to synchronize selected custom fields, which are relevant to their specific use-cases. Just as it was with the newly created cards, you can select the properties to be synchronized between the linked cards. As soon as you confirm the linking, the values of the properties selected for synchronization will be taken from the source card and will be applied to the destination card. In the first two scenarios, the source card is the one we link from. In the third scenario, the source card is the one we drag over the destination card. 4. How to edit the Sync settings? 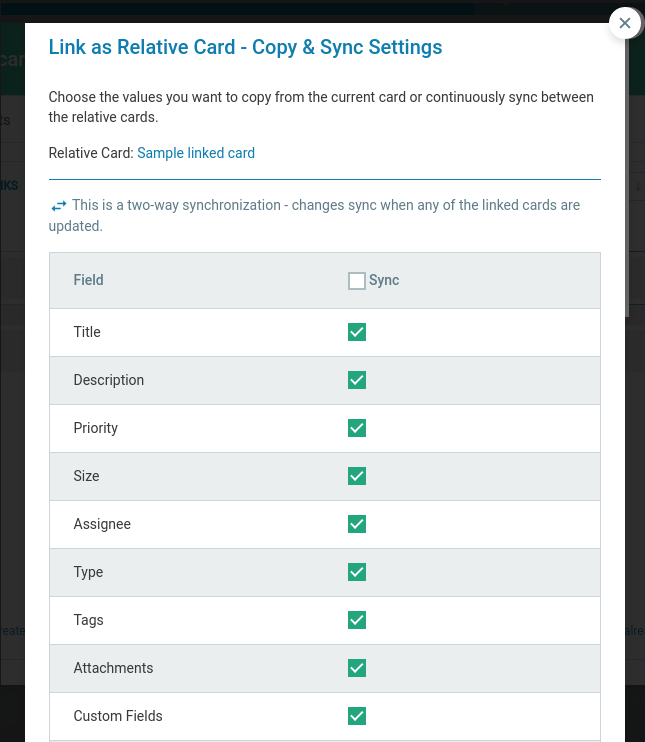 You can easily change the sync settings in already established card relation. Open the card details and go to the Links Overview at the bottom right side of the card -> hover over the linked card and click the "copy and sync" settings icon to expand the panel of options.